If you’ve got a hankering for some classic 16-bit arcade gaming, the internet is awash with tutorials on how to build your own machine that can emulate almost any game. 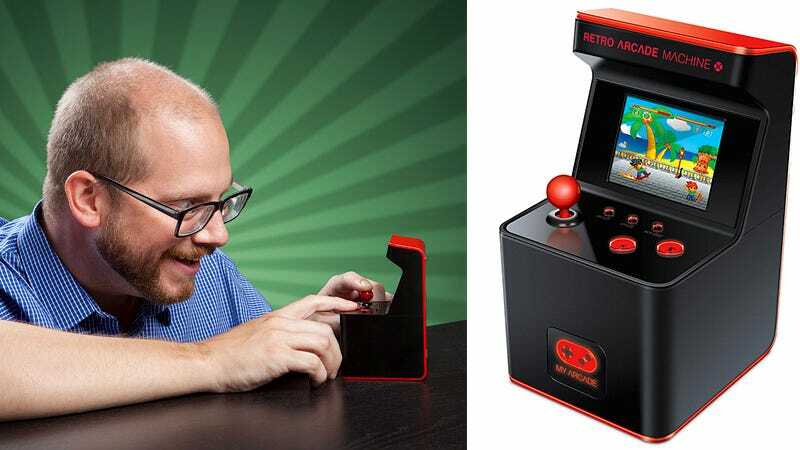 But why waste your precious free time building, when for just $25 this tiny working arcade includes 300 titles that get you gaming right away? Are any of the included games A-list titles? Probably not. Will you be helping Mario rescue the Princess? No. But you also don’t have to worry about hunting down the right parts online, soldering electronics, downloading ROMs, configuring emulators, or any of that hassle. Just slap three AAA batteries inside the tiny arcade, power it up, and start mashing buttons. With 300 games to choose from, the odds are in your favor that at least a handful of them will be an enjoyable way to make conference calls less agonizing.